Starting with the ordering process, when I went to purchase a new copy on Amazon it was difficult to determine whether Dragon NaturallySpeaking came with a headset. Amazon presented it in a bundle with a headset, so I assumed that was done for a reason other than emptying my wallet, and I foolishly ordered the bundle. When my order arrived, I found that the Dragon NaturallySpeaking box included a headset, making me question why I had purchased a second one. Because a critical problem with the older version that I was using, version 11 Home Edition, was a result of my computer sound card adding too much noise, I decided to test the separate headset first and see how the sound quality came out. That was yet another mistake; I should not have opened that package, I should have sent it back promptly. The separate headset, a KOSS CS100, is basically a piece of junk that should never have been suggested by Amazon. It is uncomfortable to wear, but more important for my purposes the mic boom is not sufficiently adjustable, leaving the mic directly in the path of every breath I take. The mic also lacks any kind of windscreen, so every breath I take is loudly recorded by the microphone. 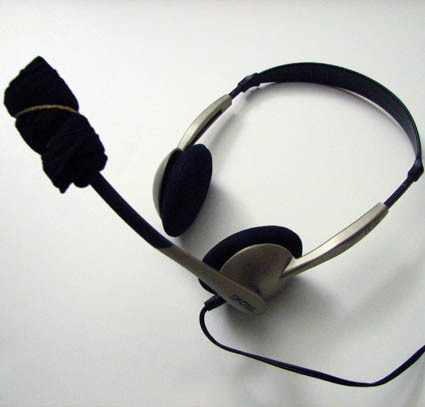 I was able to solve this with an old audio production trick of using a nylon stocking, folded over and attached with a rubber band, but this adds bulk and is ugly (as you can see in the photo here), and I should not have needed to add anything to make the headset reasonably useful. My initial impression of the Dragon NaturallySpeaking software itself was positive, because the recognition accuracy was very high even without training. In fact, this blog post was entirely dictated but I still have not done any training of the software. Unfortunately, the positive impression faded rapidly when I found that the new version of the software does not work with most other applications that I use on my computer. I should not need to own a specific word processor just to use Dragon NaturallySpeaking, but I am dictating this into Microsoft Word because nothing else seems to work. Earlier versions worked with a wide variety of other software, but apparently Nuance decided to change how Dragon NaturallySpeaking works with other applications, and most do not work anymore. This was a huge disappointment. I do not want to be limited to using Word or the clunky second-window tool provided by Dragon just to dictate text. This version of Dragon leaves me little other choice, but I have one last hope for it. Something the earlier version I used did not support was the use of a digital audio recorder to record dictation away from the computer and then transcribe it on the computer. This version is supposed to support that, and if it does I will still be able to get some decent use from Dragon. If it does not, I will probably uninstall it until Nuance decides to update the software to make it work with more third-party applications again, which probably isn’t likely at all meaning that I would never reinstall it. In that case, my decision to upgrade would be an expensive mistake. If you are evaluating Dragon NaturallySpeaking with an interest in buying it, I cannot recommend buying version 13. If you have an older version, you should probably just keep it. If you don’t own it at all, you should either try to buy an older version or find another dictation option. Perhaps later I will be able to post a new blog entry with better news about this dictation software, but I am not hopeful about that. I will be testing the digital audio recorder use soon, but I need to purchase some batteries for the lapel mics that I want to use with my recorder to give me more mobility when dictating. If you have found a way to make Dragon NaturallySpeaking work with common applications such as Evernote, please leave your findings in the comments. I would like to discover that things are better than they seem to be at this point. I won’t be holding my breath.